Cyber Monday 2011 big KitchenAid Professional Mixer Sale! Best prices ever seen for a KitchenAid Pro Mixer; $209 for a KitchenAid Cinnamon Pro Stand Mixer or KitchenAid Silver Professional Mixer(after $50 KitchenAid rebate). Don’t miss this one-day Cyber Monday sale at Amazon! You will NEVER see prices like this again and mixers are sure to sell out, so hurry! Also you can opt out of the Food + Wine Magazine subscription and get another $24 off, for a total of $185 + free shipping for one of the KitchenAid Pro Mixers above! Just want the best price for a 5 quart Artisan Mixer right now?…Thanks to a $30 kitchenaid rebate, for 210$ + free shipping you can buy kitchenaid cobalt blue stand mixer. There are dozens of other colors to choose from as well, some of which are just slightly higher than the Cobalt Blue listed above and they have the $30 rebate too. Click on the link and hover over them to see. Stay tuned because there are always updates for the KitchenAid Artisan 5 Quart Stand Mixer. Previously we had the free Food Grinder or Slicer / Shredder attachment for stand mixers. Now we have something even better; huge price reductions on some of the more rare mixer colors. Better yet, there is a 30$ KitchenAid Rebate after buying a mixer! Check out the other similarly-priced colors, almost all of them have the 30$ rebate deal.. Deals and price fluctuations with the different colors will be updated as they change; there are around 15 other colors that are available for a little bit more. Amazon is featuring the Professional KitchenAid 10 Speed 5 + Series Mixer for one of the lowest prices it’s ever been, 242$ – over 40% off! Like all KitchenAid products you can feel the quality of the product by the substantial weight. This is a good median between the 5 quart Artisan and the 6 quart pro. Whatever baking or cooking job needs to be done these artisan mixers can handle it. The lowest price is the KitchenAid classic 4.5 quart mixer which is $198 today only, including FREE SHIPPING. 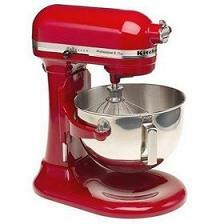 For baking, KitchenAid mixers are unmatched in terms of power and durability. You don’t need to constantly rotate the dough; the mixer does it automatically. Reconditioned Mixer Sale: Save more money on these refurbished kitchenaid mixers. Amazon has a reconditioned White KitchenAid 5-Quart Stand Mixer for 192$. Also might be a good idea to watch the shop.kitchenaid outlet as they have numerous remanufactured mixers at discount prices. Like a KitchenAid Onyx Black Pro Series 5 quart Mixer for 189$!!! – normally 400$. Don’t let someone else get these deals! Amazingly, even a 239$ reconditioned 600 series mixer at shop kitchenaid. All these fantastic KitchenAid Mixers work perfectly with the added utilities like the meat grinder, slicer, strainer, etc. Amazon often times has deals for these additions so consider what functions you will need when you buy the mixer to save even more $! It’s unbelievable how often I used this.